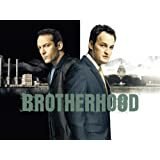 Brotherhood premiered on SHO on July 9, 2006. Amidst the weathered row houses and rust-barnacled tugboats framing the port city of Providence, Rhode Island, lies an Irish-American neighborhood known as "The Hill." There, the old-world ways of street justice and loyalty still permeate through the tough blue-collar neighborhood. It is where the familial bonds of the Caffee brothers are constantly teetering above a moral abyss, something akin to the classic sibling fable of Cain and Abel. It is this tradition that Brotherhood follows. Brotherhood tells the story of two brothers who sometimes share a twisted sense of moral compromise - both with their own skewed, idealistic visions of what makes the American dream. They live the lie that noble ends can sometimes only be accomplished through dubious means.